Ten Percent Law: Ten percent law for the transfer of energy from one trophic level to the next was introduced by Lindeman (1942). According to this law, during the transfer of energy from organic food from one trophic level to the next, only about ten percent of the of energy from organic matter is stored as flesh. The remaining is lost during transfer, broken down in respiration, or lost to incomplete digestion by higher trophic levels. 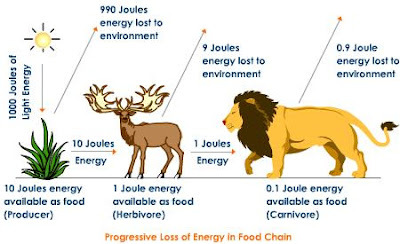 The ten percent law suggests or implies that exactly 90% of the energy is lost in the transfer at each trophic level, and that only 10% is passed on as useable biological energy. That implied preciseness is misleading, however, and is one of the reasons that many scientists discount the concept, even label it a myth. Instead, it should be considered a rule of thumb, a teaching device, or perhaps best, a mnemonic device that serves as a reminder of the striking inefficiencies of natural systems.